eBay India, India's leading online marketplace, today announced special auctions of Chandramukhi memorabilia in association with Sivaji Productions & Galatta.com. Chandramukhi, the Tamil box office hit, is a Rajnikant starrer and superstar Rajnikant costumes and props are up for grabs along with costumes worn by actresses Jothika & Nayanthara.25 different items are up for auction including a unique experience of breakfast with the late Sivaji Ganesh's family. Every costume or prop comes signed with a certificate of authenticity from the producers. This record-breaking movie, soon slated to cross 200 days, is another milestone in Superstar Rajinikanth's career. The successful bidders will have the opportunity of collecting the articles in person from the Chandramukhi stars themselves, at the Silver Jubilee celebrations of the film. All the proceeds from the Chandramukhi auction will go to the Sivaji Prabhu Charities Trust, which has earmarked the funds for the AWWA (Army Wives Welfare Association) and to the Rotary Educational Charity for adopting a Government school. eBay India has been associated with many successful Bollywood movie memorabilia auctions for many years now. This is the first time, eBay is hosting the auctions for a Tamil movie and could be the beginning of many regional movie memorabilia being auctioned on eBay. Galatta.com has created the website for the film Chandramukhi (www.chandramukhithefilm.com) and also for the late legend Chevalier Sivaji Ganesan and are managing the auction for the producers. This auction could well be another important chapter in the legend's history and a milestone in the Tamil movie industry. eBay India (www.ebay.in), India's leading online marketplace, is India's biggest online trading community where anyone can sell or buy almost anything. eBay India is a trading platform offering auctions, quick buy and classifieds modes of person-to-person trading. There are a wide range of products listed on eBay India in an array of categories including Art & Antiques, Apparel, Bollywood, Books & Magazines, Cars & Bikes, Computers, Home and Personal Loans, Electronics, Cameras & Optics, Movies, Music, Health & Beauty, Gifts, Home, Jewellery, Mobile Phones, Real Estate, Toys & Baby Products, Travel etc. 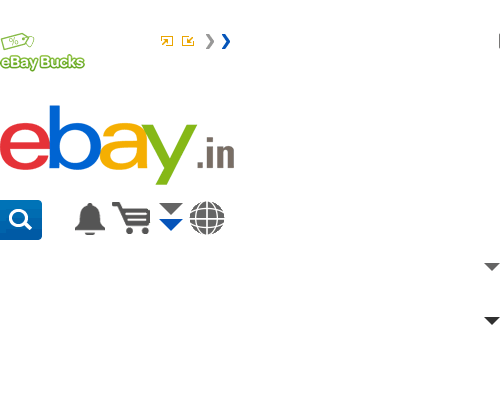 eBay India is a 100% subsidiary of eBay.com, The World's Online Marketplace. Founded in September 1995, eBay (Nasdaq: EBAY) is The World's Online Marketplace® for the sale of goods and services by a diverse community of individuals and small businesses. Today, the eBay community includes more than a hundred million registered members from around the world. People spend more time on eBay than any other online site, making it the most popular shopping destination on the Internet. People from all over the world buy and sell on eBay. Currently, eBay has local sites that serve Australia, Austria, Belgium, Canada, China, France, Germany, Hong Kong, India, Ireland, Italy, Malaysia, the Netherlands, New Zealand, the Philippines, Singapore, South Korea, Spain, Sweden, Switzerland, Taiwan, the United Kingdom, and the United States. In addition, eBay has a presence in Latin America through its investment MercadoLibre.com. Note: if you have questions about how to use eBay, our policies, or you need to report a concern, or require assistance, please contact Customer Support.